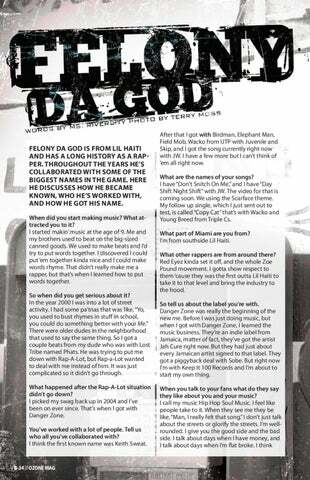 Felony da God is from Lil Haiti and has a long history as a rapper. Throughout the years he’s collaborated with some of the biggest names in the game. Here he discusses how he became known, who he’s worked with, and how he got his name. When did you start making music? What attracted you to it? I started makin’ music at the age of 9. Me and my brothers used to beat on the big-sized canned goods. We used to make beats and I’d try to put words together. I discovered I could put ‘em together kinda nice and I could make words rhyme. 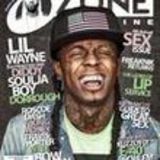 That didn’t really make me a rapper, but that’s when I learned how to put words together. So when did you get serious about it? In the year 2000 I was into a lot of street activity. I had some pa’tnas that was like, “Yo, you used to bust rhymes in stuff in school, you could do something better with your life.” There were older dudes in the neighborhood that used to say the same thing. So I got a couple beats from my dude who was with Lost Tribe named Phats. He was trying to put me down with Rap-A-Lot, but Rap-a-Lot wanted to deal with me instead of him. It was just complicated so it didn’t go through. What happened after the Rap-A-Lot situation didn’t go down? I picked my swag back up in 2004 and I’ve been on ever since. That’s when I got with Danger Zone. You’ve worked with a lot of people. Tell us who all you’ve collaborated with? I think the first known name was Keith Sweat.